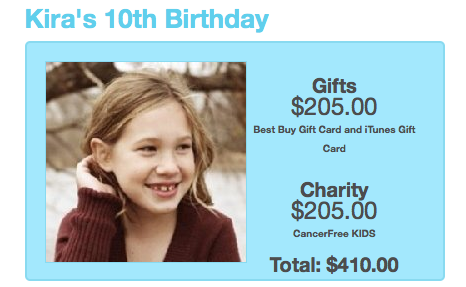 For her birthday, Kira got a Best Buy gift card and Cancer Free Kids got $205! | ECHOage - Get great gifts. Give to charity. ← For her birthday, Tessa got books and a shopping spree at a local toy store. The George Hull Centre for Children and Families got $180. For her birthday, Kira got a Best Buy gift card and Cancer Free Kids got $205! Meet Kira who turned 10 doing what she loves. Kira chose to support Cancer Free Kids because she is part of the Kindness and Caring Club at her school and she is always looking for new ways to help others. Cancer Free Kids is working everyday to eradicate cancer as a life-threatening disease in children by funding promising research that might otherwise go unfunded. Kira chose her birthday gifts – Best Buy gift cards – because she really loves playing on her iTouch and her Nintendo DS, and now she can get more games. Happy Birthday Kira from everyone at ECHOage who is watching you lead the way.